One of SuperStop's brand new services, north of Dublin. All facilities except the fuel payment, a toilet and a shower close at 23:00. Parking is free for all vehicles, up to a maximum of 4 hours for cars and 12 hours for other vehicles. Lusk is also known as Round Towers services and, during planning, as 'M1 South services'. In terms of road layout, the site is designed like many 1990s British services, such as Tibshelf. It could effectively be its own dumbbell interchange. Externally, the design is like newer services, with relatively low land prices affording a very spacious design. Although the two buildings are the same, the car park arrangement is different. 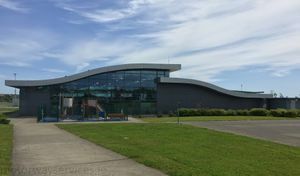 The building is a standard Applegreen layout, but with an additional toilet block accessible from outside, for use when the main building is closed. It replaced an Applegreen garage at Balbriggan as the main service area on the route. Although not a signposted service station, Applegreen built Balbriggan to get an early foot-in on the route. The services opened on 8 September 2010.